Have you ever thought that in order to meet a person from any country of the Globe all you need to do is to sit comfortably on your chair or sofa in front of the computer, laptop or just to use your mobile phone? Of course you do, if you are a teenager or fairly young. But if you are above thirty, forty or even fifty and sixty it could still sound a bit strange for you. 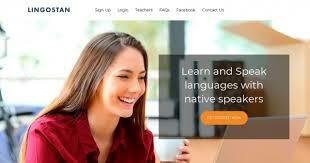 New online language learning platforms like Lingostan.com make your life as easy as if you can imagine. Your elder child is going to pass his exam for getting a certificate in Spanish language. And you are not sure about his level of proficiency. Then, you might want to prevent a possible failure and let him work with an online professional teacher from the comfort of his room. After several lessons you receive an objective feedback regarding possible successful completion of the course from an independent professional. And, if necessary to study up! Your husband is continuously bothering you with his urgent requests to review and edit a contract with a foreign partner in order to check grammar and lexicology correctness. Delegate this task to a dedicated specialist! And devote this time to yourself only. No matter where you will invest your saved time, the most important thing is that you will, finally, have it! Your younger fourteen-years-old beauty is speaking all the day and night long? Let’s direct her “brilliant conversational skills” into the right place. Learning a foreign language requires a lot of energy and, of course, of time. Now, she has to think over every foreign simple word to be heard and understood correctly. As a result, at least one hour less spent for chatting on the phone. Who knows, probably, she is a future interpreter and her ability to look and to think freshly after four-hour negotiations might be her key benefit. And you, of course. There is a bonus for you. You have a dream of speaking French and to visit Paris, but up to the moment it’s not moving forward and still looks so far. Sign up now and get three trial lessons for free. If you want to learn French for pleasure and travelling it would be better to learn this language with our tutor – a native speaker. By the way, currently there is a package deal available. Probably, that’s exactly what you are looking for to cover all language needs of your family. Save your budget and enjoy using the Lingostan services. One more thing – don’t give up on the route towards your dream. It would be so great to go to Paris in summer, to walk down through the charming streets bathing with greenery and flowers, to smell a mixed aroma of perfumes and French baguette going from everywhere and to enjoy a cup of coffee (of course with croissant) on the open terrace of the restaurant. What do you think?